“A Walk to Remember Victims of Christ Church, New Zealand”, organized by Morris County Islamic Centers and Different Faiths, One Family Interfaith was held on Sunday, March 17. Participants walked and held dialogues to show their support of the victims of Christ Church, Mosques, and all other recent shootings at the places of worship. Participants walked and prayed together in unity to show that evil may try to hurt our bond of humanity, peace and love, but goodness will always overcome the evil. Approximately 200 supporters participated in the event, including prominent elected officials, local police departments, and religious leaders from this area. 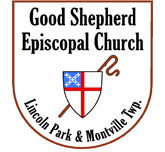 Good Shepherd Episcopal Church (Lincoln Park and Towaco) was represented by the Reverend Canon Lesley Hay.